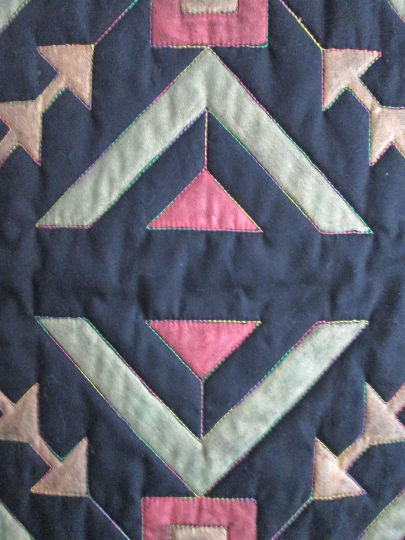 Offering this beautiful quilted southwestern table runner or art wall hanging. 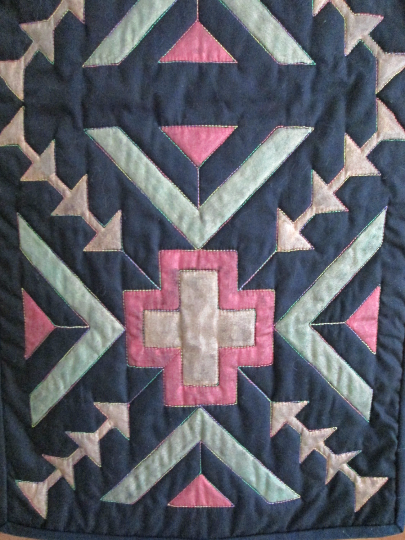 Rich black fabric, quilted in colorful variegated thread - southwestern Native American pattern. Hand painted in green, russet copper, and gold metalic fabric paints. Hand bound and comes with hanging sleeve on back. Measures 12" x 36". Made in my quilt shop in the USA. High quality fabrics used, quilted on my long arm quilting machine and hand accessorized. A wonderful one of a kind piece of art to compliment any home! Items Similar To "Southwestern Table Runner Hand Painted"